Land Rover pulled the plug on the iconic Defender in February 2016.. 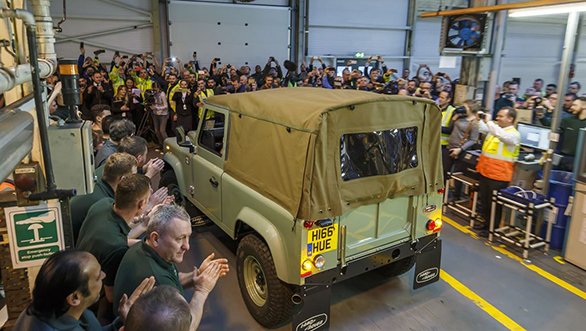 The UK plant which was building the Land Rover Defenders had been in operation for over 68 years. The list of people who have owned this British legend include Sean Connery, Robin Williams and also members of the Royal family including Queen Elizabeth II. 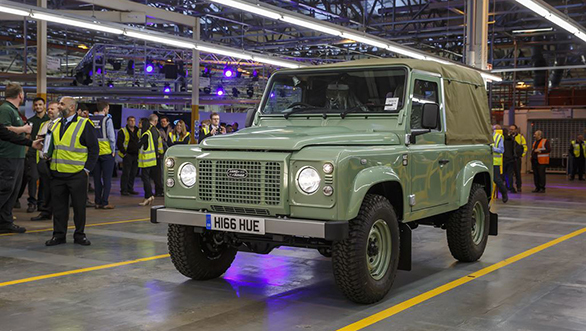 To commemorate this special event, over 700 current and former employees were invited to see and drive some of the most important vehicles, like the first pre-production 'Huey' Series I as well as the last vehicle off the production line, a Defender 90 Heritage Soft Top. To make it even more special, there were more than 25 unique vehicles which were driven in a convoy around the Solihull plant. The last Defender, which was also featured in the convoy, has a component that has been used on the Soft Top since 1948, the hood cleat. This vehicle, which is of historic relevance, will be housed in the Jaguar Land Rover's car museum. The idea behind the Land Rover Defender was conceived by a simple line drawing on the sand. Through its 68 year life span, the Defender proved to be one of the most rugged and versatile off-road vehicles that could make its way on almost impossible terrains. Land Rover has sold more than two million units of Defender. The body shell of the Series I was made of aluminium, because Britain had a shortage of steel after World War II, but had sufficient aluminium. Nick Rogers, group engineering director at Jaguar Land Rover commented, "This is a special day of fond celebration for Jaguar Land Rover. We all have personal memories of Defender. It's a true motoring icon and is much loved around the world. The world has changed dramatically in the last 68 years, but this vehicle has remained a constant - something no other vehicle can claim. The last of the current Defender models embraces the vehicle's simplicity, honesty and charm - it represents its Series Land Rover heritage. Creating the Defender of tomorrow, a dream for any engineer or designer, is the next exciting chapter and we are looking forward to taking on that challenge." The first Land Rover design sketch was made in the sand on the beach at Red Wharf Bay in Anglesey by the engineering director of the British motor manufacturer, Rover. Maurice Wilks (right) owned land on the island and wanted a versatile vehicle that could double as a light tractor and off-roader. It was christened the 'Land Rover' and he showed the proposal to his brother Spencer, Rover's managing director. What had once been considered as a stop gap until Rover could introduce a new post-war car, ended up being produced in greater numbers than the Rover cars - an event anticipated by the board as early as November 1948.